The Moon seems to change its shape every night. Just like the earth, the Moon is also in space and is always half illuminated by the Sun. Hence the Moon has a day side and a night side. From our earth, as the Moon orbits around the earth, we see varying fractions of its day and night sides and hence it appears to change shape or phase. New Moon:This phase occurs when the Sun and Moon are on the same side of the Earth and we see only the dark side. On this day the Sun and Moon rise and set approximately together. First quarter:This phase occurs when the western half of the Moon is illuminated so that it looks like the letter "D". On that day the Moon rises at noon and sets at midnight. Full Moon: -This stage occurs when the Moon is on the opposite side of the Earth from the Sun and we see only the illuminated side. On that day it rises as the Sun is setting and sets aa the Sun is rising. It is visible all night long. Last Quarter Moon: The Third Quarter phase occurs when the eastern half of the Moon is illuminated. On that day it rises at midnight and sets at noon. 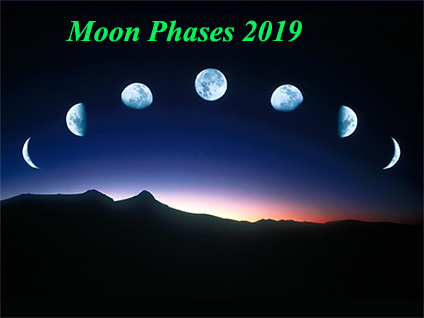 Here's a complete list of all Moon phases dates in 2019 year, exact hours are also given. This would be quite useful for any sky-watching enthusiast.